A quick, easy and healthy salad. If you’re looking for a slightly more filling option, try adding quinoa – a super healthy substitute to couscous or bulgur wheat. 1. Make the dressing by whisking together the rapeseed oil and lemon juice to taste. Season with freshly ground black pepper and sea salt. Set aside. 2. Steam or boil the broccoli for three to four minutes until just tender but with a little bite. 3. While the broccoli is cooking toast the seeds by tipping them into a small frying pan. Add the soy sauce and cook over a medium heat, tossing regularly to coat all over, for about three minutes until the seeds are crisp and golden. Take care not to burn them or they will taste bitter. 4. 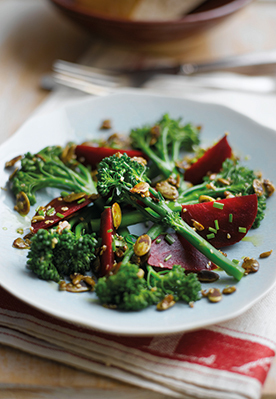 Arrange the cooked broccoli and beetroot wedges on a plate, drizzle over the dressing and sprinkle over the toasted seeds and chives. Serve immediately.